The Asia Pacific College Dance Company (APCDC) is one of the Performing Arts Groups in Asia Pacific College. The group develops passion, talent and discipline among its student members. Since 2010, the APC Dance Company has been conducting an annual thanksgiving concert for those who has been part of their successes. Called Seasons, we are now on our 6th year of showing our gratitude and inspiring others through dance. In every concert, there is a theme that depicts what we have experienced all throughout the year. This year’s #SeasonsSix will take place on APRIL 4, 2019 at the Asia Pacific College Auditorium. Our Seasons Concerts give our audience a whole other level of entertainment where we combine dancing with acting. We tell stories through movement. APCDC’s Seasons Concerts are one of the much awaited events in the APC Community. This year’s story is a different one from the last concerts. It depicts a story that we all experience especially in this generation. 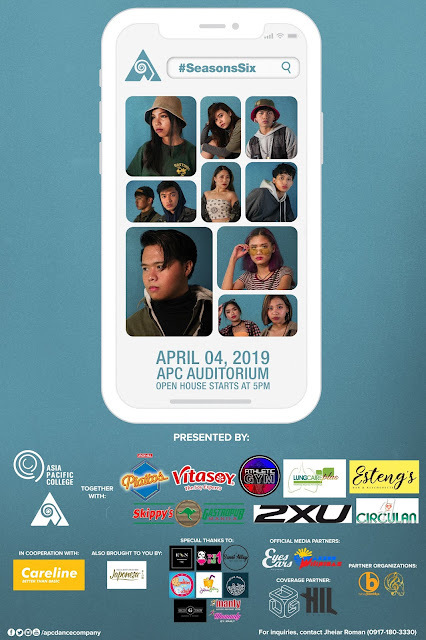 For more information, you could visit us at our facebook account, www.facebook.com/APCDanceCompany and also in our Twitter and Instagram account, @apcdancecompany .